The 1822 Bougainvillea House is located deep in the French Quarter, part of an intriguing region known for its historic homes, paddlewheelers, legendary plantations shaded by stately oaks, cypress lined bayous, the Mississippi River, the famous St. Charles Avenue Streetcar, and the Riverwalk and Canal Place shopping malls ... the best of the old and the new. The beat of a Dixieland band is the pulse of our joyous city. Jazz was born here, and many of the great names in music have their roots here. Known for fun filled nights, we also have a world-renowned reputation for fantastic food, Mardi Gras, and Jazz and French Quarter Fests. The 1822 Bougainvillea House units are as unique as the city and will fulfill your expectations. Some of the amenities include: 11-foot ceilings, free off-street parking, tropical patios, and antique furniture. 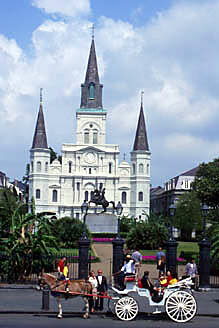 Our location is within walking distance of Royal Street, Jax Brewery shops, Ole Man River and its riverboats, the Convention Center, Harrah's Casino, the National WWII Museum, St. Louis Cathedral, the Superdome, and many more great and exciting New Orleans sights, sounds, and culinary delights.